We are pleased to be able to offer the OVA SPIKES programming! CEPEO Students, and Families with more than one child enrolled receive a discount!! LOCATION: L'Heritage High School in Cornwall. 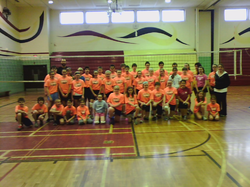 The Cornwall VIKINGS Volleyball Club has been running Youth Development since 2010 and we are continuing to build our programs to offer young athletes a taste of just how much fun volleyball can be!!! Our programs will help your daughter or son to learn the game of volleyball. We anticipate major growth in the level of participation in the sport of volleyball in the coming years and SPIKES is a great way to get kids in the game at an early age. Experienced coaches give individual verbal assessments to each participant. After observing each athlete we offer them tips on how to improve their technique based on their age, skill level and individual ability. The first 45 minutes to an hour is based upon building skills in setting, passing, serving and attacking- just to name a few........Then we mix up the participants and PLAY! From the contact form on our home page, reserve your spot by sending us an email : click on the clinic of your choice. REGISTRATION is not yet open!! To run an effective clinic we must have a minimum of 16 participants per session. Please secure your spot early as some sessions will fill QUICKLY!! Registration instructions are posted on our main page and a reservation email is highly suggested!! Registration and payment can also be made onsite on the first day of programming if the program is not yet full. Cheques are made payable to Cornwall Vikings Volleyball Club or payment can be made by e-transfer.